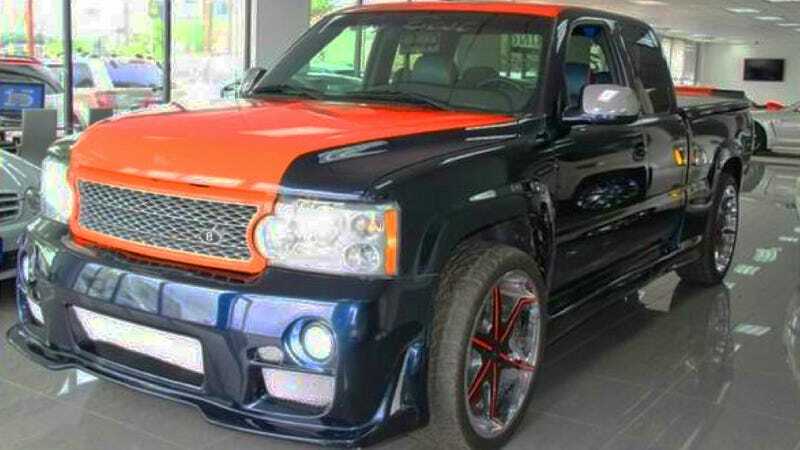 This frankentruck is part Chevrolet Silverado 2500, part Range Rover, part tuner-car, and all... well, what do you think? It's for sale at around 16 grand right now, having done duty as a "shop demo truck" according to the ad. "Used for many competitions and shows, most recently featured in the Grand Master Flex show in NJ expo center." Think they mean Funkmaster Flex, or is Grand Master Flash into cars now too? The quilted leather isn't really my style, nor are the wheels, or paint job... but the custom work actually looks pretty well executed. I even kind of dig the way the Range Rover face fits on the full-sized truck, but they would have achieved a much better continuity of design using a slightly younger Silverado. Reckon the more-dramatic wheel arches and squared rear of the 2006+ Chevy C/Ks would complement that Range Rover styling a lot more seamlessly.